If you work with a windows based computer, you have seen this message before. The question most people have is are these really worth it? The clear and obvious answer is yes. 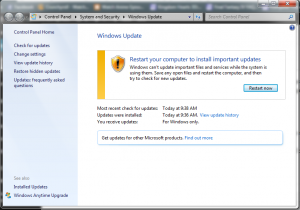 Keeping your Windows OS(operating system) up to date is the first step in protecting your systems from security breaches, faulty software and improving the performance of your computer. In this easy quick step guide I will show you how to perform a systems check to see if you have any outstanding updates, installing these updates and performing a routine check. Navigate over to your start menu . From here you will click on “All Programs” which will bring up an entire list of your installed programs and applications. You will then have an exterior window pop up as shown below. 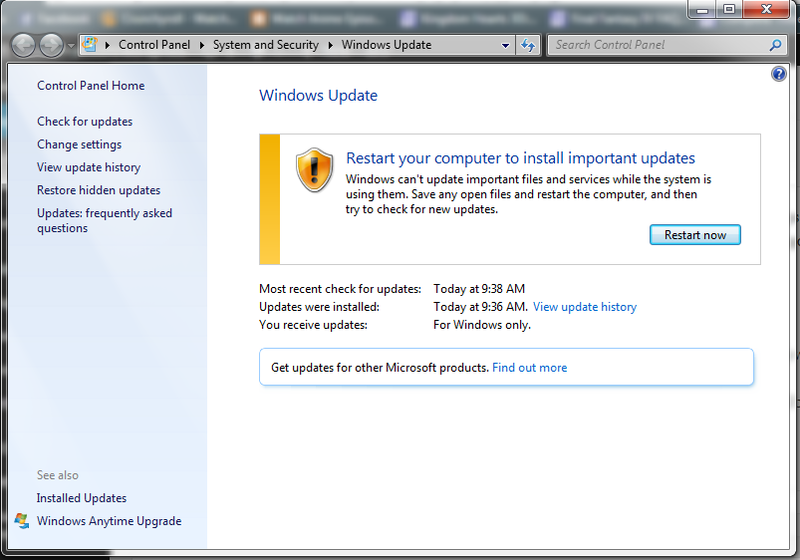 There are multiple variations depending on the status of your updates. As shown above you will receive this message when you already have installed all the required updates and a simple restart of your system will apply these changes. Windows 8 and Windows 7 function the same way once you are inside the windows update application the only difference is the route of navigating to Windows Update. Unlike Windows 7 and opening up a start menu you will be simply using the search button on your right hand tool bar. Hover your mouse cursor over the top right corner and open up the search bar(It is displayed as a magnifying glass) then once you have opened that up simply type in “Windows Update” and it will appear at the top of your searches. Once you have done that the same prompt window will open as in Windows 7 and the steps will remain the same. Keeping your systems up to date is the first step in having a smooth and seamless experience when working with your computer. If you are still struggling to update your devices or receiving error problems the experienced staff here at Houston PC Services can either assist you remotely or do a house call for you so give us a call today! Or simply log on to the windows service support homepage to help guide your through even further.